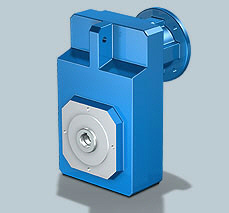 Slim gear housing with large shaft-centre distance for specific specifications. Closed, torsionally rigid and maintenance-free block design. Output with solid shaft or hollow shaft with spiral groove. Purchase your Stober MGS F Shaft-Mounted Helical Gear Unit today!